Light: Enjoying healthy fantasies and daydreams. Using your imagination. Practicing magic or celebrating the magic of everyday life. Attuning yourself to the cycles of nature. Embracing the unknown. Shadow: Becoming unable to separate fantasy from reality. Suffering from delusions. Losing your appreciation for the fantastic or magical. Adopting a ruthlessly logical mindset. Failing to appreciate life’s mysteries. Mythical/Spiritual: Kali, the dark-skinned divine mother associated with time, the eternal night, and the female principle. Hecate, goddess of night and darkness, who, like Anubis, assists others in their travels to the underworld. Story: With nothing left to lose, the main character commits to a dangerous or unlikely course of action as part of a last-ditch effort to reach his or her goal. Relationships. Moonlight becomes you, so don’t be afraid to indulge in a little romantic lunacy. Navigating your way to a fulfilling relationship involves risks. Some people will say you’re crazy. Pay attention to your instincts, surround yourself with loyal guides, and make your move. Work. Avoid linear/logical approaches and go with your gut. Brainstorm. Put the rules aside and use your imagination. What would happen if restrictions were removed? What might happen? What could happen? A little lunacy can be a good thing; blow off steam, change your habits, and try working in a different light. Spirituality. How does your personal spiritual path incorporate the Divine Feminine? What qualities would a divine mother offer? Which aspects of your personal spirituality would benefit from a feminine touch? How might contact with the divine feminine benefit you today? How might you honor or invite that energy? Personal Growth. Faced with an uncertain future, you might feel led to abandon your search for self and crawl back into your shell. You can move forward without tossing caution to the wind. Uncertainty can be the mother of great creativity. Listen your instincts, clarify your path, and keep going. Fortune Telling. Watch for problems at the end of the month. Someone you know needs to howl at the moon more often. Someone is about to change his or her mind about an important decision. The moon. This “lesser light to rule the night” renews itself every 28 days, linking it to cycles of all sorts, including menstruation. By extension, it is also associated with rare events (“once in a blue moon”). How is your situation shaped by repeating events? By rare ones? Brilliant droplets. 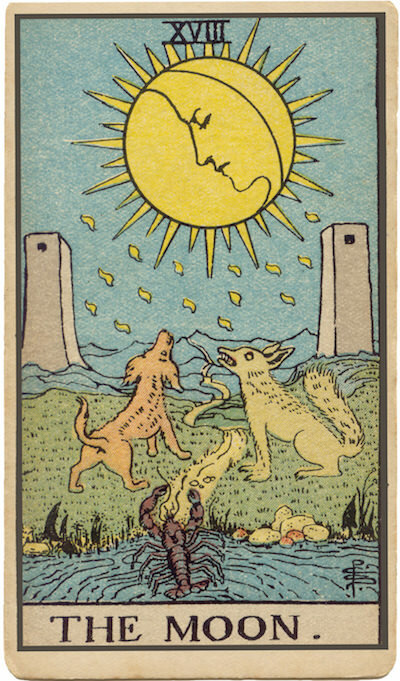 The Marseilles Moon (and many RWS-inspired Moons) exudes a shower of brilliant droplets; in The Pictorial Key to the Tarot, Waite calls these “the dew of thought.” To what extent might your own fears be rooted in imagination alone? Baying hounds/howling wolves. Waite cast these as fears; later commentators position the hounds and wolves as faithful familiars—animal helpers who, like Hecate, lend aid on our journey through darkness. Which familiars can you call on for help today? The crayfish or lobster. The night can put us in contact with our deepest, most instinctual fears. Here, this representative of our most primitive brain crawls up from the depths of the subconscious mind and bathes itself in the light of the moon. What is your greatest fear? Does it play a role in your current situation? The two towers. The path between the two towers leads into unknown territory. In your own situation, what remains unknown? How can you limit the influence of these variables? How can I face my fears and move forward? What helpers can serve me as guides through my personal darkness? How can I deal with the unknown in healthy ways?